Want to make sure grandma is safe when she’s home alone? Your Smart Home Monitoring System works with the Vivint Medical Alert pendant to signal you when she’s in danger. You’ll also be clued in if an entrance to your home is used with Vivint door sensors and Vivint window sensors. Plus, with smoke and fire alarms, you’ll get notified quickly about rising smoke levels before a fire does major damage. 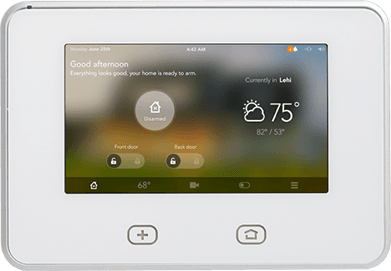 Plus, the Vivint Smart Home plan lets you integrate home automation equipment like the Nest Learning Thermostat, Vivint Doorbell Camera, Kwikset Smart Lock, and more—all from the user-friendly, sleek Sky Hub. Have your arms full of groceries and need some light in the kitchen? Just ask Amazon Echo’s Alexa to turn on the lights or lock the doors behind you. And with Vivint Flex Pay, you can choose to pay off your security system equipment over a period of time or purchase your security equipment upfront to enjoy a no-contract monthly fee for monitoring and automation services.